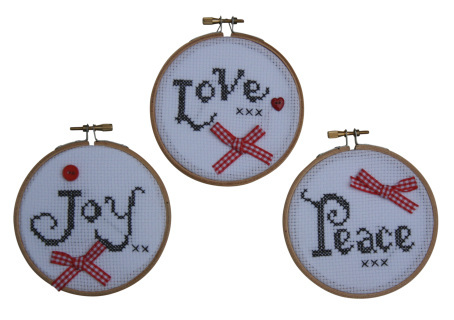 Cross Stitch this adorable ‘Love, Joy & peace’ wall hanging set. This is a fantastic activity for both adults and children alike. Your kit contains everything you need to complete these three easy projects. Once completed, you will have three cute, handmade keep sakes that you will want to hang all year around. Two embroidery needles, a spare for all those annoying times they get lost down the sofa. And finally getting started directions for all you beginners or those needing a refresher. Although this will make a fantastic family activity, please note that this kit contains functioning needles and scissors so children will need supervision.